Stephen Constantine also lauded skipper Sunil Chhetri and goalkeeper Gurpreet Singh Sandhu after India's 2-0 victory over Kenya in the final of Intercontinental Cup. India captain Sunil Chhetri during the Intercontinental Cup final against Kenya. "We know we have a huge task going to the Asian Cup. (We are) not going to make up the numbers, we believe that if we do the right things between now and then, we believe that we have a chance to qualify from the group and that will be our target," Constantine said after India beat Kenya 2-0 in the final last night. The Asian Cup will be played in the UAE, next January. India are clubbed with UAE, Bahrain and Thailand. "This tournament gave us the opportunity to prepare as we would prepare in the Asian Cup. (If) we make it to the last 16 of the Asia Cup, these are the kind of games that we expect. The character and resilience of the team is what impressed me the most (in the final)," he added. Lavishing praise on talismanic skipper Sunil Chhetri, who scored both of India's goals against Kenya, and goalkeeper Gurpreet Singh Sandhu, Constantine said the two players hardly ever need to be told what the situation demands of them. "Sunil and Gurpreet (Singh Sandhu) are two (members) of the squad, they will tell you themselves, they can tell what they do. Sunil is unbelievably fit, looks after himself, completely professional on and off the pitch, and that is why he is able to maintain the level of fitness that he has," Constantine explained. Throwing some light on Chhetri's level of dedication, Constantine said the tournament's highest goal-scorer is dismissive of any suggestion of taking rest. 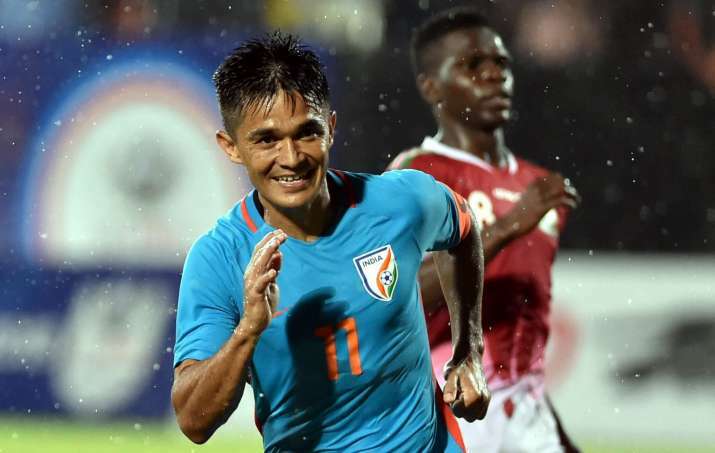 Chhetri achieved a massive career milestone with last night's brace as he equalled Argentine superstar Lionel Messi's tally of international goals. "It is not easy, but he is looking after himself and as long as he is able to do that, he is able to do the work. We need him in the Asian Cup. "I can't protect him from club football, but I didn't want to play him in the third game. But he starts mourning, so ok (I played him)," Constantine said. Reflecting on last night's performance, Constantine said the Kenyans had an upperhand in the second half. "(In the) second half Kenya put a lot of pressure on us, I really appreciate the work that the boys did and in the end we deserved this (the title). This is our success, just not me and the boys, but everybody," Constantine said. Asked which part of the victory was more special, the Englishman quipped, "2-0." "The work rate was phenomenal specially in the second half when we were tired and the Kenyan showed how tough they are because they played two days ago and were still able to put pressure on us," he noted. The coach revealed that there will "definitely be two warm-up games before the Asian Cup, sometime in December." "We will be looking to play 28-29 (December), about a week before our first game (in the AFC Asian Cup on January 6). I can't tell you the opponents but I am working on it. "November we are close with an away game in Saudi (Arabia), but again this is not a 100 per cent , but it is close. October we have one or two possibilities. "September there is the SAAF tournament. And in a month's time we start preparation for the Asian Games and thank you to the Olympic Committee for allowing us to go. We need those games and exposure," he said.